A wide variety of habitats, but especially in deciduous forests under a hardwood tree. This is a common, easily recognized mushroom. Morels are one of the “Foolproof Four”, the four most easily identified mushrooms. It is found growing alone, scattered, or clustered on the ground under hardwoods, often poking through leaf litter. The cap is hollow; usually egg-shaped with a blunt, cone-shaped tip; 1¼″ to 4¼″ long; and ¾″ to 2⅜″wide. Sometimes it is round, cone-shaped, or irregular in shape. It is deeply pitted with irregularly shaped and randomly oriented pits. The edges of the pits are broadly angled, not sharp. The overall color of the cap is yellowish-brown. When young the cap is shallowly pitted, the ridges are yellow or whitish, and the pits are grayish-brown or dark brown. When mature the cap is deeply pitted and the ridges are the same color or slightly paler than the pits. The ridges do not turn black with age. The margin of the cap is attached directly to the stalk but it is often creased at that point and may appear unattached. The stalk is usually ⅜″to 2″ long, and ⅜″to 1″thick, usually shorter than the cap. In favorable conditions it may get much longer with age. It is hollow; whitish, pale yellowish-brown, or tan; and usually granular. False Morel (Gyromitra esculenta) surface is folded, not pitted. The cap is not completely fused to the stem. The stem is not hollow. Poisonous. This is the state mushroom of Minnesota. 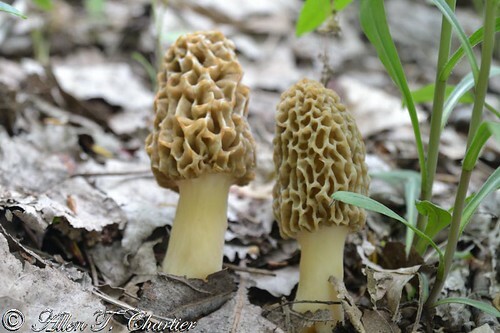 Morel hunters are notoriously loath to part with information about the location of morels, and will often give disinformation to those who ask. This is a tradition among morel hunters. Most print and online sources agree, however, that morels are often found at the base of elm trees that are dead or infected with dutch elm disease and dying. A quick look at Morchella Esculenta. One of Michigan's spring time fungi. In Michigan, I think there are more morel pickers than deer hunters ! Morchella Esculenta and Morchella Semilibera hunting May 10, 2009. A beautiful and productive day to be in the woods !! How to find, identify and harvest Common Morels, Desired by chefs and sell for $50 a pound. Also know as yellow or white morel mushrooms, you must cook out the toxins before eating them and beware of "false morels". Morel hunting. A mycological treat for epicurean foodies, a 20 cm Yellow Morel (Morchella esculenta)! Photographed at the Turtle River State Park, North Dakota (11 June 2013). How to identify and find morels! I just check this area yesterday and not a sign. Today, a couple of Morels freshly popping up.